Today - the 31st August - we are delighted to have a Guest Illustrator Post from Patrice Aggs..
Patrice Aggs writes and illustrates children's books. Her latest is Yi Er San, My First Chinese Nursery Rhymes (Frances Lincoln). Right now she's obsessed with kids' comics, and is about to begin her 4th adventure series for The Phoenix. Thank you - and hello to everyone at An Awfully Big Blog Adventure! Cut whom? I hear you ask. 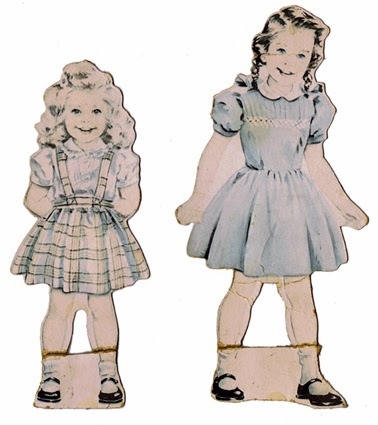 Betty and Susan, who along with brother Tom were the star cast of Ginn Basic Readers in the 1950s and 60s. If you grew up in the American elementary school system these three were your first reading buddies. Even if you were an urban black child, Tom, Betty and Susan represented the correct template for the outside world. By the early 1960s, it was surely time for these guys to be hobbled. Enter Bob and Nancy. They were black children, and were neat, tidy and acceptable. Of course they slid seamlessly into the comfortable world Tom, Betty and Susan lived in. Never mind that Bob and Nancy probably went to quite separate schools and lived in quite separate neighbourhoods from their white pals. In Ginn Readerland they were always just around the corner when somebody wanted to ‘see Bunny ride’. Where was this weird part of America in which Nancy cavorted with white kids on ponies wearing cowboy hats? It made no sense to us black city kids. 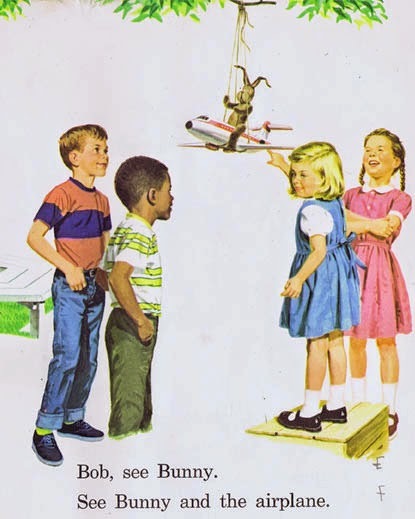 The imagery was clearly aimed at suburban white children, to soften them up for the possible introduction, sometime in the future, of black classmates or neighbours. It made no sense to us. But did it need to? The world of schoolbooks was always one of unreality, as was much of what went on in the classroom. Black kids who grew up in 1950s America finished their daily Pledge of Allegiance with the phrase “with liberty and justice for all – but me.” We were already aware that we were outsiders. Whenever a person of colour appeared in a drawing there were black sticks or crosshatched lines all over their faces. So schoolbook characters being unreal aliens was pretty much what we had come to expect. Did these characters need to reflect the real world in order for us to learn to read? No. Were we damaged by being deprived of visual evidence of our existence? Maybe, maybe not. It was a step forward to see ourselves realistically portrayed, but it was also really boring. Nancy’s hairdo is spot on for 1960, and yes, she’s in colour-matched Sears Roebuck playclothes. But she and Bob came along too late. We already knew fictional characters were fundamentally bizarre and different from us. Luckily, that made the world of reading really exciting. There were benefits to knowing all about unreal aliens. My friends and I devoured the E. Nesbit books found in our superb local library. Mind you, we’d have devoured anything that wasn’t Tom or Betty or Susan. Nowadays I am often asked how on earth we managed to ‘relate’ to stories about Edwardian children. How could we possibly understand norfolks, florins, cook-generals , fire irons or nursery fenders? Very easily, as it turned out. Challenging language with mysterious references was what we were used to. No, we couldn’t have explained stone gingerbeer bottles or something called ‘shape’ that people had for dessert. But pinafored children in the Kentish Town Road were agreeably exotic, and no more peculiar than Nancy in a cowboy hat. The real pity is that the exchange of exotic words and images couldn’t work the other way round. In a time-travel sequence it would be fun to test out the strength of writing around unfamiliar vocabulary. What would an English child in 1906 have thought of our own black Americanisms? Okay, do y’all know what she’s talking about? Very interesting ideas and perspective here, Patrice. Thanks! I'm not sure quite what she means - is "gunny sack" a bag and "chiffarobe" a cupboard? 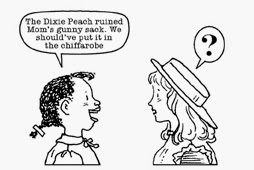 And how is a "Dixie Peach" different to an ordinary peach? Reading book children were very odd robot creatures in any case, I think. 'Jane has a ball. The ball is red. Jane has a red ball.' etc etc. But, yes, you are quite right. We need children who behave like children of all sorts in those very important first books that make, or don't make, us into readers. Thank you, Patrice. A gunny sack's an agricultural hessian feed sack. Hessian? Americans call it burlap. And yes, a chiffarobe's a cross between a breakfront cupboard and a wardrobe. Dixie Peach? It's hair oil! !